REC founded in Norway in 1996 has grown into a leading innovator of solar PV technology with over 2000 employees and an advanced manufacturing plant in Singapore producing a modest 1.4 GW of solar panels per year. REC is now the largest European owned supplier of solar modules and growing rapidly with a total production volume increase of almost 40% in 2018, although this is still relatively small compared to the large Chinese solar manufacturers. With both the operations headquarters and manufacturing facility located in Singapore REC is a fully vertically integrated company which means they produce everything from the silicon ingots, cell wafers and complete module assembly, thus the company has complete control over the quality and traceability of all components. REC claims to have the lowest warranty rate in the industry which is a big call and hard to verify, although considering the largely positive feedback we have from the Australian solar professionals they are definitely known for high reliability and good performance, especially in the harsh Australian climate with very few known quality issues. REC was the first company worldwide to release panels utilising the innovative split module design with half-cut cells, rather than the standard full size square cells. Due to the many advantages and improved efficiency of the half-cell design this clever innovation is now becoming an industry standard with many other manufacturers developing panels with half-cut cells. REC also incorporate the high efficiency PERC cell architecture in the full range of TwinPeak panels. The half-cut cell and split module design effectively splits the panel into two halves with 60 ‘half-size’ cells in each section resulting in a total of 120 cells. The two halves are joined in parallel at the center of the panel but operate separately which means if one half is shaded it does not reduce the performance of the other half of the panel. Traditional full size 60 cell panels can suffer up to 40% power loss when a small portion the panel is shaded. Another advantage of half-cut cell format is the current is reduced to half per side which in turn reduces resistance and losses by 75% and lowers the potential of hot spot formation from shaded cells. Further to this, due to the lower current the busbars are can be reduced in size meaning less cell shading and further efficiency improvements. All up the half-cut cell and split panel design results in higher efficiency and improved performance over the life of the panel. 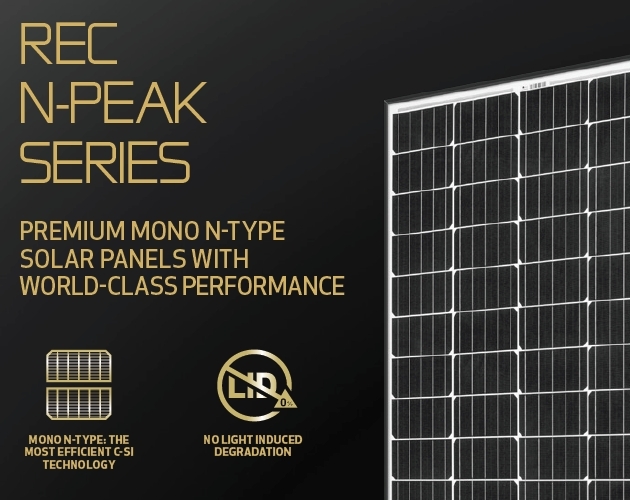 The release of the new N-Peak series of panels have once again positioned REC as the leaders in half-cut cell technology. REC are now the first manufacturer to develop a half-cut cells using high performance N-type silicon as opposed to the more common lower cost P-type mono or multi silicon wafers. This puts REC in a similar league to LG, Panasonic and SunPower who are the only other manufacturers to use the more advanced, high purity N-type silicon wafers, although as yet neither of these leading manufacturers have developed panels using half-cut cells. In addition to the N-type silicon REC have included PERT or ‘passivated emitter rear totally diffused’ cell technology. The PERT process improves cell efficiency by using full passivation on the back side of the cell to absorb more light photons and generating more energy. REC have a range of multicrystalline panels for residential and commercial applications utilising the half-cut PERC cell format with various panel sizes available. The new N-peak series however use high grade N-type monocrystalline silicon cells to deliver up to 330W with increased all round performance and reliability. The solar industry is moving back towards more efficiency mono cells but REC have gone one step further with developing N-type mono cells. At the budget end of the range are the Peak Energy standard 60 cell panels using multicrystalline silicon cells to offer 260 to 275W power output, with a standard 10 year product warranty and 25 year performance warranty. The renowned TwinPeak series of panels from REC were the first to use half-cut cells and offered 265W to 295W power ratings utilising the multicrystalline half-cut PERC cells. Now with a standard 20 year product warranty and 25 year performance warranty. The next evolution TwinPeak 2 range of panels increased power output up to 300W using more efficient multi PERC monocrystalline half-cut cells. Now with a standard 20 year product warranty and 25 year performance warranty. At the top of the range is the new advanced N-Peak panels with up to 330W power output. The higher performance and increased efficiency is due to the high grade N-type silicon cells utilising PERT architecture. 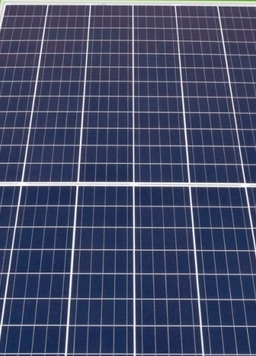 Naturally the N-Peak panels are expected to come at premium price being around 20% higher than common mono panels, but with the higher price comes higher performance and efficiency with lower degradation over the life of panel. The N-peak panels also feature a reinforced frame structure with extra support bracing across the rear of the panel, plus a longer 12 year product warranty and improved performance warranty with 86% retained capacity after 25 years. REC offer the same half-cut split panel technology for commercial applications but in the common larger 72 cell format, plus standard 72 cell multicrystalline panels. REC panels have consistently scored well in the internationally recognised DNV-GL independent solar module testing program scoring as a ‘Top performer’ in all four durability tests. The latest 2018 DNV-GL test results now make the REC TwinPeak modules one of the Top Performers for the third year in a row. The high grade N-type silicon cells used in the new N-peak panels claim to drastically reduce LID or ‘light induced degradation’ which means they will out-perform all common panels using the standard P-type cells. All solar panels lose capacity over time, with the standard degradation rate of 0.7 to 0.8% per year resulting in around 80% output after 25 years, however the N-peak’s high grade N-type silicon cells have a very low degradation rate of less than 0.5% per year. This means after 25 years the N-peak panels are warranted to still maintain 86% of the original rated output which is in-line with LG Neon 2 modules which also use N-type silicon based cells. Despite the good track record and very low failure rate REC have had a few unusual quality issues over recent years with out-of-square panels being the main problem highlighted by installers. Australian installers have reported frames being noticeably out of tolerance by up to 6mm which makes it difficult to align and fix a solar array to solar cutters standards. REC claim this issue has been corrected and now no recently released panels have been reported with this problem. Possibly due to the aforementioned frame issue REC have now engineered a new high strength frame design for the new N-Peak series with two additional cross members to reinforce the entire frame structure (and keep it square). This increases the panel maximum load bearing from 5400 Pa to 7000 Pa which is far above the industry standard. UPDATE* As off Jan 2019 REC now offer a 20 year manufacturer’s or Product warranty together (previously 10 year) with the standard 25 performance warranty on all TwinPeak and N-peak panels. However the REC solar installer certification program boosts the product warranty by an additional 5 years, for a total product warranty period of 25 years. Read more about the REC solar professional program here. The new warranty announcement is a big step up from the previous 10 year product warranty, but it is not surprising considering REC’s very good reputation and low failure rates. The new generation N-peak panels will with come with a 20 year product warranty and 25 year performance warranty to 86% retained power output. With global support offices in the US, Germany, India, Japan, Singapore and a local support office in Melbourne REC have a relatively good reputation and service in the event of a warranty issue or claim. With a solid track record and low failure rate the REC Twinpeak range of panels have been a highly reliable choice and a regular favorite among customers and installers, especially when partial shading is an issue. The new impressive 20 year product warranty now puts REC ahead of most other manufacturers and highlights the confidence REC must have in their manufacturing and quality control capabilities. With the frame issue now in the past and the release of the new high performance, extra strength N-peak panels with low degradation N-type cells, REC has now moved into the premium class of panels, although the price will no doubt increase accordingly. Although as those in the industry know, the relatively small additional cost of higher grade panels with with N-type cells brings greater performance, reliability and increased generation over the life of the system.